(i) The gas is heated at constant volume so that its pressure is doubled. (ii) The gas is then made to undergo isothermal expansion so that the pressure is restored to the initial value. (iii) The gas then undergoes an isobaric compression so that its volume is restored to the initial value. (a) Draw a P-V diagram to represent the processes numbered (i), (ii) and (iii) above, marking the initial (as well as final) state of the gas by point A, and the intermediate states by points B and C.
(b) What is the final temperature of the gas? Justify your answer. (c) During the process (i) what is the work done by the gas? Justify your answer. (d) Calculate the volume (V2) of the gas at the end of the isothermal expansion mentioned in process (ii). (e) If the work done by the gas during its isothermal expansion is given to be 1.45P0V0, calculate the net work done during the entire cycle of operations involving the processes (i), (ii) and (iii). (ii) The piston is now pulled up with a gradually increasing force of final value 60 N, maintaining the temperature at 27º C itself. The volume of the gas now becomes V2. This state of the gas is designated as state B. (iii) The temperature of the gas is now increased to 100º C by placing the cylinder in contact with a bath containing boiling water. The volume of the gas now becomes V3. 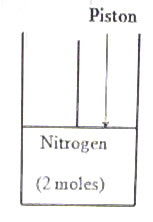 This state of the gas is designated as state C.
(iv) With the cylinder still in contact with the boiling water bath, the pulling force of 60 N on the piston is now withdrawn and the gas is allowed to get compresed to state D.
(c) Calculate the pressure of the gas in state C.
(e) Calculate the work done when the gas changes its state from D to E as mentioned in (v) above. Try to answer the above questions which carry 10 points each. You can take about 11 minutes for answering each question. I’ll be back soon with model answers for your benefit.